Nebraska Grain Farmers Hit An Economic Boom With Corn Crop Thanks To Technology Rising grain prices may spell bad news for consumers. But for corn growers, there's hardly been a better time for business. Global market conditions and new farming technology have boosted the state's farmers toward the top of the struggling U.S. economy. 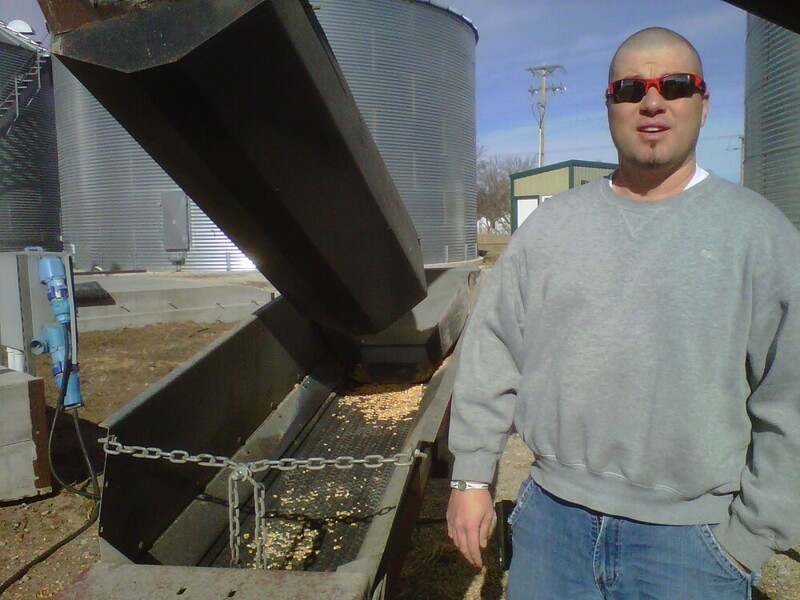 Brandon Hunnicutt, a Nebraska corn farmer, uses technology — and even Twitter — to run his farm. Rising grain prices may put the fear of inflation into many American consumers, but in states where wheat and corn are grown, the high prices have been a godsend. That's especially clear in Nebraska, where ideal market conditions and new technologies have allowed farmers to rise toward the top of a struggling national economy. During recent years in America's Corn Belt, the average price for a bushel of corn has doubled to $6. The price leap has been similar for soybeans and wheat. Economist Ernie Goss of Creighton University in Omaha told NPR's Robert Siegel, "If states were stocks, I'd be selling California and buying Nebraska, Iowa, South Dakota, North Dakota and Kansas." Although you can't buy shares of the fertile plains of central Nebraska, you can buy farmland — with a whopping price tag. Kelly Holthus, president of Cornerstone Bank in York, Neb., says that with the high price of corn, farmland is selling between double and triple the prices from about a decade ago. Tough economic times have not typically been so kind to farmers. The aftermaths of the Great Depression and the 1980s recession were devastating for agriculture. But today's farmers seem to be coming away unscathed from the Great Recession that began in 2008. "What recession?" Holthus says with a laugh. There are several reasons why high grain prices have kept Nebraska corn growers flush. First, the government's current policy mandates that gasoline contain ethanol.That guarantees huge domestic demand for corn; more than one-third of our corn goes into the gas tank. It also helps that the Federal Reserve's policies have contributed to a weakened U.S. dollar. Thirdly, Asia's big, emerging economies are buying more and different kinds of food. And finally, extreme weather in some parts of the world, such as Ukraine, have destroyed grain crops. That has helped make American grain much more valuable. Ethanol policy: The U.S. government mandates that gasoline should contain ethanol. That guarantees huge domestic demand for corn; more than one-third of our corn goes into the gas tank. Declining dollar: The Federal Reserve's policies have contributed to a weakened U.S. dollar. Growing Asia: The big emerging economies of the continent are buying more and different kinds of food. Extreme weather: Drought in Ukraine, for example, has destroyed crops overseas, making American grain that much more valuable. But farmers' success goes beyond these advantages. In the 1980s, when Nebraska farms were failing and Willie Nelson was doing FarmAid concerts, Brandon Hunnicutt was in grade school. Now, 37-year-old Hunnicutt is the picture of a 21st century corn grower: shaved head, designer prescription sunglasses, Bluetooth earpiece. He has a master's degree, is politically active and media savvy. As for his family's 3,600-acre farm, think genetically engineered seeds, tractors guided by computer, irrigation that taps into the vast Ogallala Aquifer that sits under most of Nebraska, and even Twitter employed as a farm tool. Hunnicutt says Twitter helps him exchange important information with other farmers. For example, he says he could post a photo and a message on Twitter, i.e., "I've just found these plants dying in my field. I've never seen this before in Nebraska but it sure looks like ... sudden death syndrome in soybeans." Hunnicutt says somebody can respond with a diagnosis of the crop disease. For Hunnicutt, Internet and agricultural advances make these amazing times. "There's been a change in the seed technology over the years," he says. "We've had newer fungicides and different things coming out that helps us protect the crop more. I think we're learning how to become better farmers, and some of it's just flat out because of technology we have." In these very prosperous times, many Nebraska corn growers are spending. And, according to Holthus of Cornerstone Bank, they're not borrowing a lot. How can you not be optimistic by putting a seed in the ground knowing that the good Lord is gonna either provide the rain or you'll have that water underneath the ground, and that's how you make your livelihood. "They're using a lot of their own money," Holthus says. "These good, successful farmers are the ones we'd like to loan money to 'cause we know we're gonna get it back. And it's working a little bit in reverse that they're spending their own money." There's an economic ripple effect from all this. At a local farm equipment dealership, manager Alan Anderson says the farmers are replacing old equipment. They're buying combines and tractors with a full assortment of features. "The seats swivel, they're heated," Anderson says, describing one of his pieces of farm equipment. "The tractor has a computer on it that can tell you when to lift your hitch, drop your markers, what gear you want to run in. You can set the engine speed, or you can set how hard you want it to pull. It's all computerized. This [model] is probably $170,000." Some people say the Corn Belt boom is just another economic bubble that will burst in time. But Clint Jensen, who serves on the local advisory committee to the Department of Agriculture's Farm Service Agency, says his fellow farmers are optimists. "How can you not be optimistic by putting a seed in the ground," Jensen says, "knowing that the good Lord is gonna either provide the rain or you'll have that water underneath the ground, and that's how you make your livelihood. "You have to be optimistic, not pessimistic," Jensen added. And with corn prices up — by more than 70 percent since last June, according to the World Bank — optimism comes that much more easily.